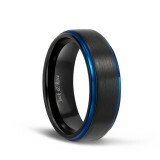 This is the second purchase I've made of a tungsten ring from FINDURINGS. I purchased the first one for myself and this one for my husband. After nearly 12 years of marriage our original wedding rings were really beaten up. These rings are very classy, comfortable, affordable, super strong and crazy durable. I wish we had just gotten these rings years ago! 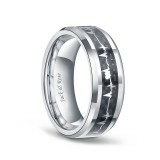 I highly recommend these, whether it's a replacement or your first wedding band. You really can't go wrong with these. Great looking ring, very comfortable. Looks better in person then it does in the photo. I've only worn the ring for a few days now and already gotten a lot of compliments. Wonderful ring. I have worn this everywhere under all conditions for five months, and it has not changed color nor scratched. It is true to size, remains shiny as new, and is very comfortable. I have never had to specifically clean it nor polish it. The price cannot be beat. 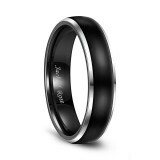 This is a no-brainer for a wedding band, especially for traveling. I am very sensitive to metals and have had zero reaction to this, no redness or swelling, a first. Seems too good to be true but really is that great! Looks great with my white gold engagement ring! Comfortable to wear and the size was spot on. 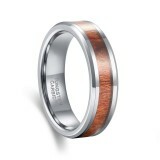 I bought this to replace my original wedding band which is also made from tungsten carbide. 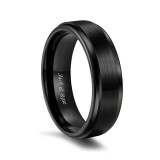 My original ring has withstood years of wear and tear without a single scratch so I definitely wanted another tungsten ring. This was a great choice. Better quality than expected for such a good price! Speedy delivery and very easy return/refund when I needed a bigger size! 5 Star Great product and durable. 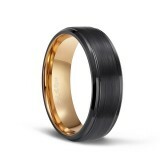 5 Star Great wedding ring! 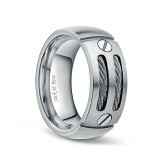 Very happy with my wedding ring, looks expensive and gets noticed. Holds up to a lot of abuse and still looks great. Has a nice heavy feel to it and yet very comfortable. Just make sure you are sized for a wider band and it runs true to size. Would definitely recommend this ring! 5 Star Very nice, great finish on them. I bought this one for myself, the 8mm for my fiance. 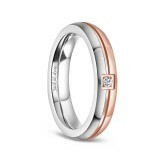 We both love them, very nice fit and bands are beautiful. Size was perfect. I love the weight of it. It is absolutely beautiful. For the price I expected it to be cheaply made, or turn my finger green. I was so proud to give these as a gift. The rings are constantly being complimented!! 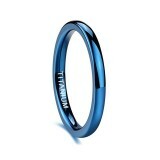 Fits just like other tungsten rings. Smooth edges and very nice. Very cute rings. Got the matching set for my wife and I to wear when we are doing things and she doesn't want to damage her fancy ring. Highly recommend, I now wear mine on my right hand the rest of time because I like it. Love the ring!!! I ordered two. Kept one and gave one to my daughter. She is expecting her first grand baby and I my first Great grand child! This seemed the perfect ring. It’s beautiful and scratch resistant. I have worn it awhile and no scratches. My daughter loves it to. I would definitely recommend it. I wear this ring everyday. I cook in it. I clean in it. I do hair in it. I operate heavy machinery in it. I bath in it, n sleep in it. 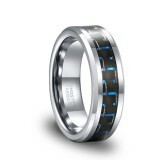 It's my wedding band. It never comes off. I've had it for about a month now and there's not a scratch on it. 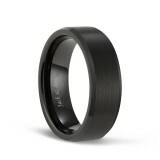 I even bought my husband the 8mm band just like it. Both of our rings still look as good as the first day we got them. 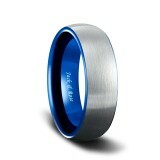 Bought it for a wedding ring for my husband. He lost his original one and chose this as a replacement. Looks great, great quality. He works construction and it is holding up well. Was a perfect gift from my girlfriend, it fits perfectly and it has a smooth brushed metal feeling, really premium. Very true to size. Extremely nice quality. It exceeds my expectations, especially for the price. Would definitely recommend and will purchase in the future again. WOW! My husband just received this gorgeous ring today. We are living in two separate states for now being I'm retired and he's not. 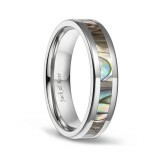 So, I surprised him with this beautiful wedding band. I haven't seen it. But, he's so happy with this beautiful gift. He said, 'this ring is so beautiful, comfortable and shines'. Great investment! We just received this ring today and it is truly even more beautiful in person. Fit was perfect and it’s got the perfect amount of subtle color to make it unique. Very impressed with the quality! We got my husbands finger sized at a jewelry store and it fits perfect. We ordered a size 11. It looks a little bit darker than the picture but I really love the way it looks and my husband said it feels comfortable. Beautiful, inexpensive, and absolutely indestructible. I wore my previous ring for several years and only bought another because I got chubby and my last ring was too tight. The first ring doesn't have a single scratch and I'm not a delicate person. Great ring! Virtually impossible to scratch. Looks great. I wear it a lot. Very well made. My husband has had this wedding ring for over 6 months and it looks like new. For the price that's hard to believe! 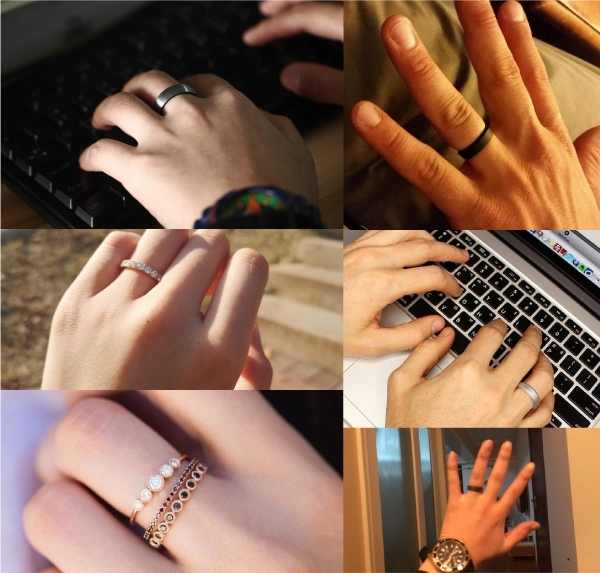 It doesn't leave marks on his finger and he says it's very comfortable to wear. The size was spot on. I think we are all suspicious of reasonably priced jewelry and worried that they are not good quality because they are cheap. but that isnt the case here. The colors are vivid, feels comfortable when worn. Worth every penny. I thought the blue would show more, but I'm overall happy with it for the price. Fits as expected. My husband works in a warehouse lifting and moving heavy stone. This ring gets abused daily and I have yet to see any scratches, knocks, or cracks in the ring. For the price, and the quality I would highly recommend. Excellent ring for the price. I went by my normal ring size and it was a perfect fit. I’ve had mine for over a week and I work with hands and it still looks the same. I did have to return one I accidentally ordered two and the refund was a breeze. Highly recommend it! Very Fetching looking ring. The curved inside really helps this ring feel comfy all the time. I bought this ring for my boyfriend as a promise ring. I am a college student living on my own so money is tight, but I wanted to get him something nice. The quality on this ring is exceptional. I'm very happy I bought this ring from this seller. Would recommend to a friend. 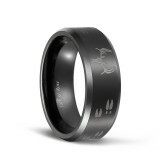 All of our rings offer personalized laser engraving. Choose the font you like, and engrave the most precious words that you think. Text, handwriting and fingerprints are supported. Customize your own unique jewelry. 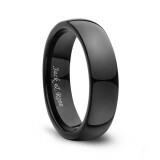 All rings are free shipping and lifetime warranty, with no minimum required. If you order, we will ship it as soon as possible. Each ring has a lifetime guarantee for size exchange and any damage. 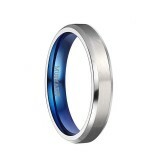 The price of our ring is very tempting, but this does not mean that they are not perfect. Low prices and high quality are what we are pursuing. 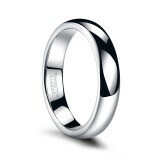 We are committed to providing you with affordable and satisfying rings.